Magickal Phoenix Force is a powerful energy that was channeled to destroy all kinds of lower astral energies, any kinds of unwanted entities, demons, and also helps to dispel any form of sorcery, dark spells, evil-eye and curses. It is also helps to break spiritual contracts related to past and present psychic attacks, and anyone that want to harms you. Besides to removes and destroy negativities, Magickal Phoenix Force is also has a special ability to protects you from them. 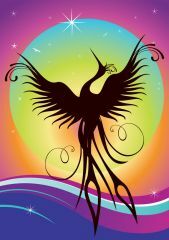 If you use this Magickal Phoenix Force to your environment, it will creates positive and harmony vibrations to the environment, and brings joy and happiness.